A vanity is necessary in your bathroom, but that doesn’t mean that the structure has to be boring. With so many small bathroom vanity ideas to choose from, it’s easy to find the right vanity that will look great and not take up too much space in your bathroom. 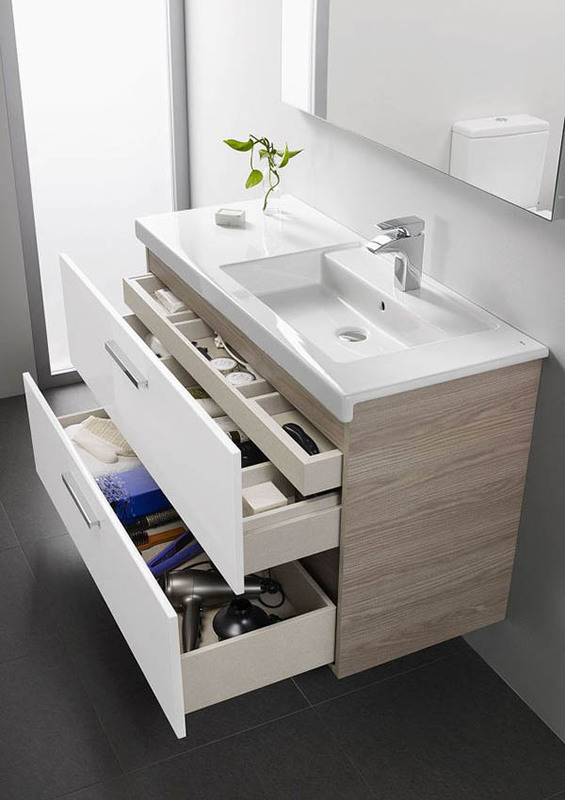 One of the best small vanity bathroom ideas is to include storage in your vanity. This is a great way to make sure that you have access to all of your necessary bath items, without having to use a closet or storage option outside of your bathroom. Instead of worrying about where you will store your towels, makeup, and hair supplies, when you choose a bathroom vanity that has plenty of door or cupboard storage, you can make sure that you always have everything that you need within easy reach. Your bathroom vanity can still offer you all of the storage that you want while providing you with the sleek and modern look, as long as you choose a vanity with a modern look. One with fine and straight lines, sleek doors that open to reveal plenty of storage space, and updated hardware will look amazing in any modern bathroom. Modern vanities are one of the best small bathroom vanity ideas and will ensure that you have plenty of storage space in your bathroom. Another one of the best bathroom vanity ideas for small spaces is a farmhouse themed vanity. While many people prefer a modern and sleek look in the bathroom, if you enjoy the farmhouse look for your home, then it’s a good idea to carry it through to your bathroom. Look for a vanity made of solid wood with open shelves, a simple countertop, and oil rubbed bronze fixtures, as well as details that will set it apart from other vanities. These may include dovetail joints. 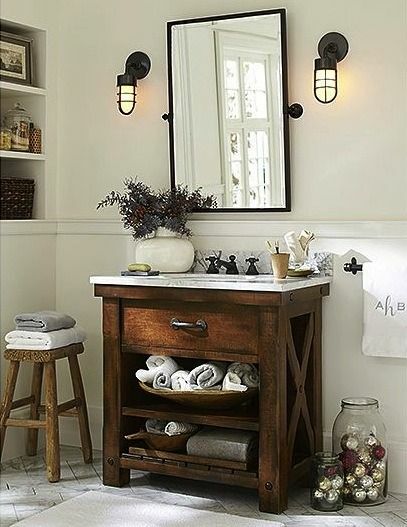 Some farmhouse lighting will make the bathroom look even more rustic. Even if you don’t have a lot of extra space in your bathroom, there are a few small bathroom corner vanity ideas that will work in most small spaces. 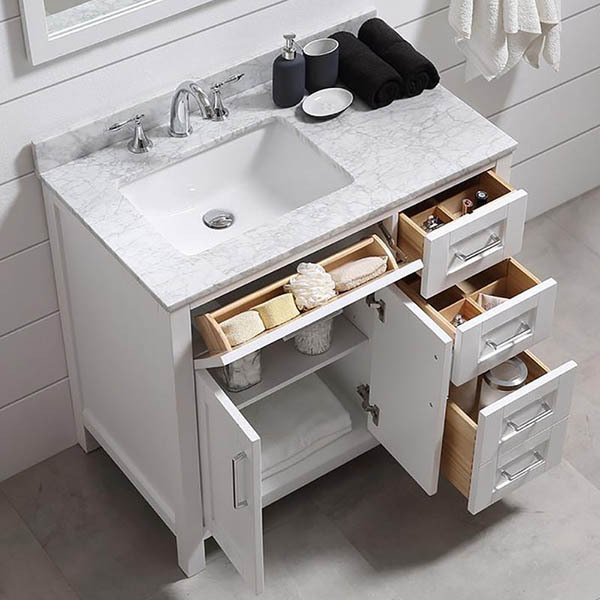 These vanities will not have nearly as large of a footprint as other vanities will, but will still offer you some storage, as well as easy access to your sink. To ensure that they look great without taking up too much space, consider a neutral color for the vanity itself with interesting hardware to make it pop. One of the main appeals of a modern vanity is that all of your storage will be hidden behind closed doors. This means that you don’t ever have to worry about your personal items and bathroom accessories being visible in your bathroom. Sleek fixtures and a seamless sink ensure that your modern vanity looks the part. Choose either a wood grain or a color that will help to improve the appearance of your vanity, as well as match with the rest of the décor in your bathroom. If you want something a little different when considering small bathroom vanity ideas, then a rustic look may be perfect for you. Instead of a heavy and large vanity taking up space, attaching floating shelves in the corner of your room gives you plenty of storage for your soap, towels, and a beautiful sink. 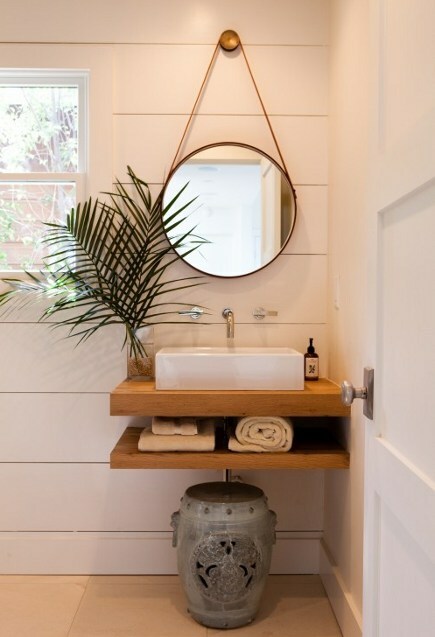 DIY mirror could compliment the overall look of the bathroom. Attaching the fixtures to the wall completes the rustic look. Everyone knows that an open space below your vanity will make your room appear larger, and one of the best small bathroom vanity decorating ideas is to leave the space below your vanity completely open. This will draw the eye to your vanity and make the space appear very airy. Attaching a towel bar across the front of the vanity will allow you space to hang your towels so it is near to the sink and out of the way. There are some very attractive small bathroom vanity cabinet ideas that will really make your vanity stand out from others. One popular option is a single cabinet door that will swing open, revealing the inside of your vanity. With shelves along the inside of the door, you are sure to have plenty of space for all of your storage needs. Because there is no exposed storage with this type of vanity, you never have to worry about your vanity appearing cluttered. 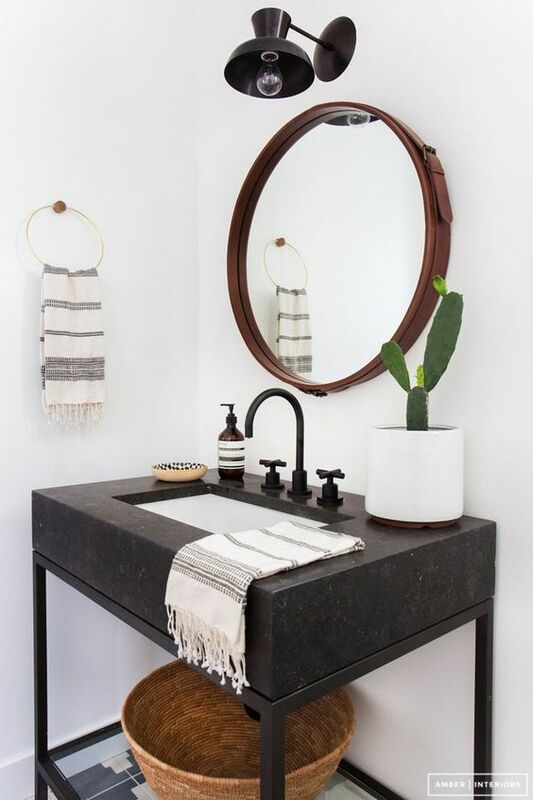 One of the most beautiful and striking bathroom vanity ideas for small bathrooms, is to have marble countertops that float, instead of resting on top of the piece of furniture with cupboards or doors. The exposed polished chrome pipes from the sink add to the beauty of this, and the heavy marble appears to be floating on thin legs. 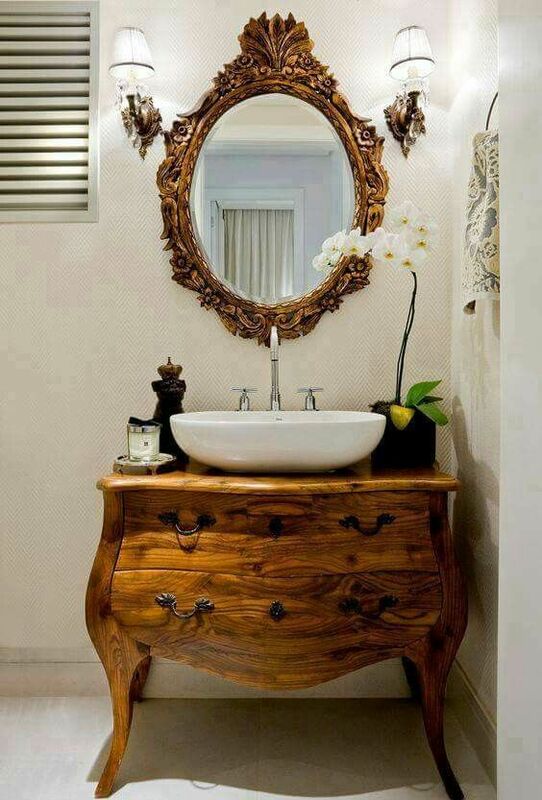 This is a very impressive vanity and it is sure to surprise and please anyone who visits your bathroom. Your vanity can fit within the theme of the rest of your home, and a vintage vanity will not look out of place in a carefully curated home filled with vintage objects. 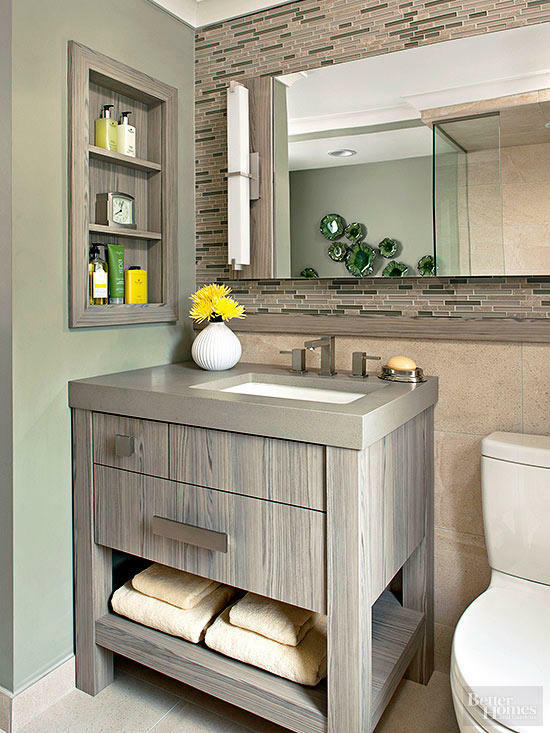 Consider a darker vanity that is open on the bottom for storage and display. 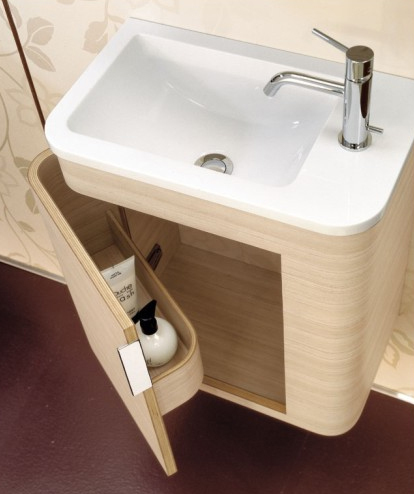 Additionally, a vanity that is made from recycled or reclaimed materials is sure to fit in with the rest of your home. One of the most fun DIY small bathroom vanity ideas is to use a ladder, instead of a regular piece of furniture. 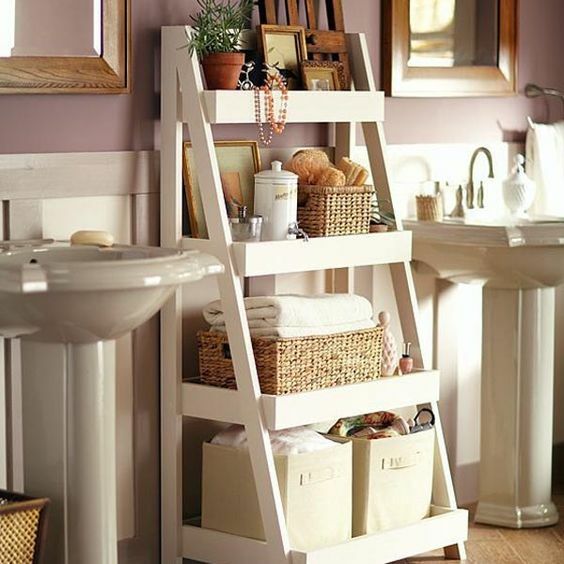 Placed next to a pedestal sink or between two pedestal sinks, this ladder offers you exposed storage for all of your bathroom needs. Using matching baskets is a great way to tie the room together and ensure that your bathroom items appear neat and orderly and not just messy. Because the ladder is removable, you can easily paint it or stain it any color that you want, so it improves the appearance of your bathroom. Beautiful pieces of furniture are thoughtful and interesting small bathroom sink vanity ideas. Whether you want to use a family heirloom or find an antique at a store, a solid piece of furniture acts as the perfect vanity in your space. A vessel sink resting on top of the surface has the unique and rustic idea, while the original handles and pulls on the furniture add to the rustic appeal. Make sure that the furniture that you choose is not wobbly, as you do not want to have problems with your plumbing. People in search of small bathroom ideas vanity for their bathroom, need to consider incredibly slim choices, especially if space is at a premium. 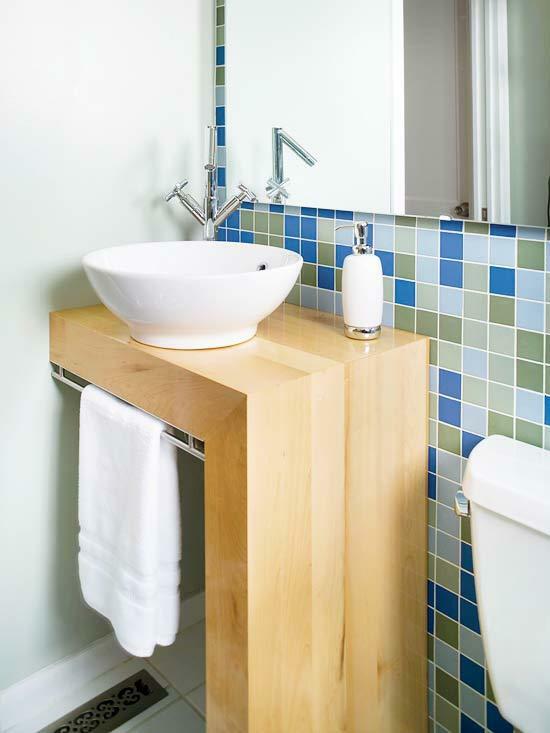 A bathroom vanity only has to be large enough to hold the sink and provide some extra storage space, if desired. 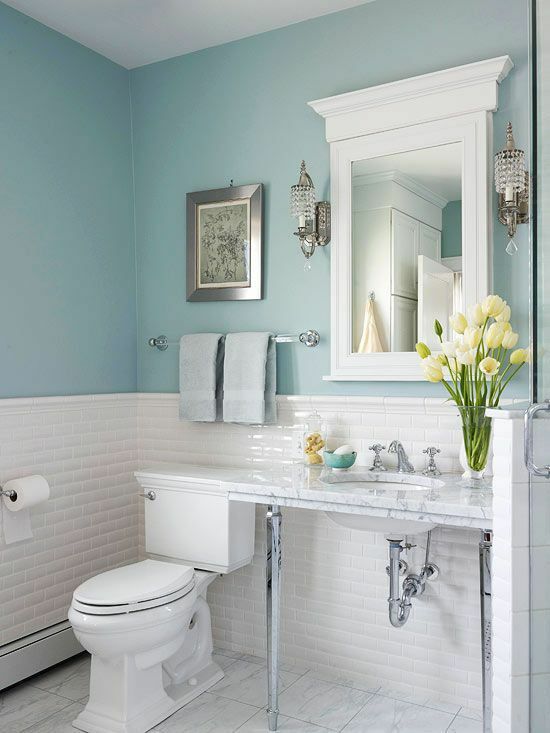 Choosing a small bathroom vanity in an interesting color such as mint green or sea foam ( which by the way is one of the best paint colors for small bathrooms ) , will ensure that this smaller piece of furniture does not disappear in your space. One interesting small bathroom vanity idea is to have the toilet actually attached to the vanity. This is ideal in very small spaces and ensures that you can always reach anything that you need from the toilet. 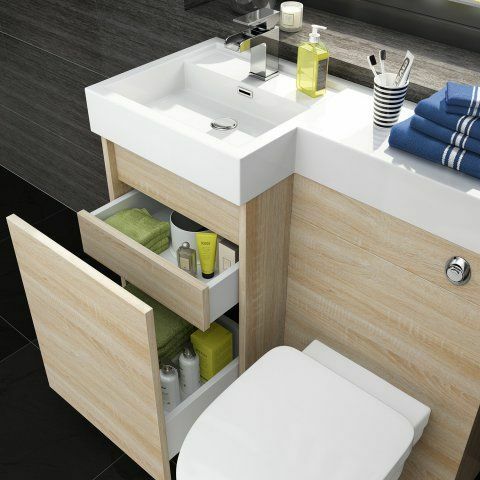 With drawers that pull out from below the sink, you have all the storage that you need within easy reach, no matter if you are using the toilet or washing your hands. 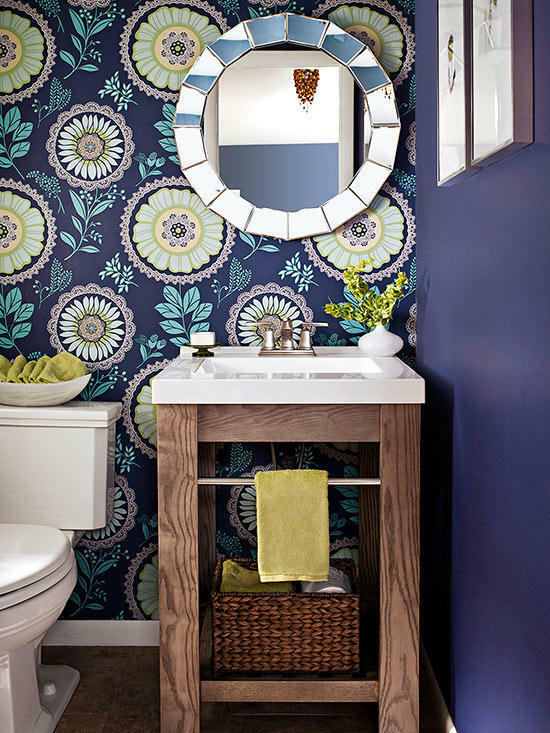 Some bathrooms are filled with very bold and bright colors, which means that the vanity needs to be able to stand up to these colors without trying to steal the show. 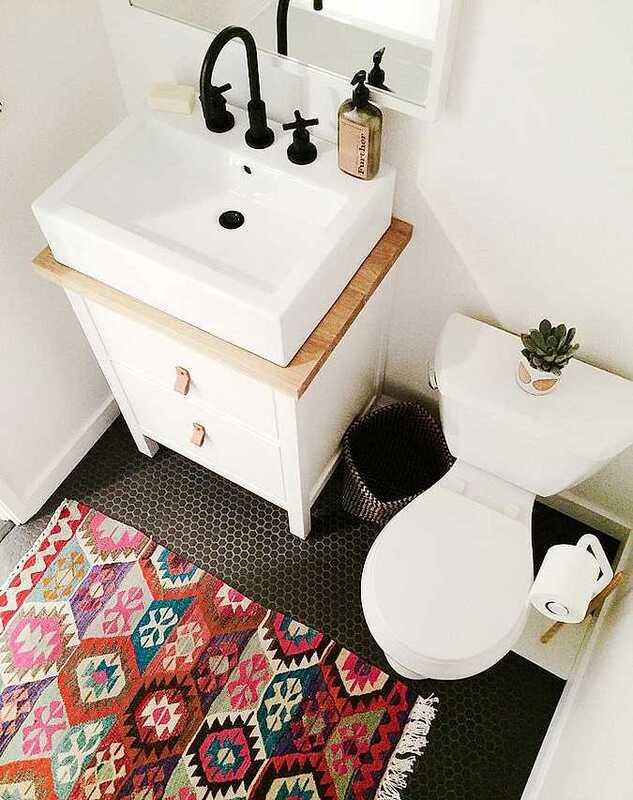 In this case, choosing between small bathroom vanity ideas is easy. Your best option will be a solid piece of furniture with open storage and a white sink, as the bold combination of natural wood and the fresh white sink will complement each other in your space. Many people who are on the hunt for small bathroom vanity storage ideas neglect to consider how their open storage will look. Instead of allowing all of your towels, toilet paper, and face and body products to be stored out in the open, by using a lidded basket or even a small wicker trunk you can still have open storage without the clutter. 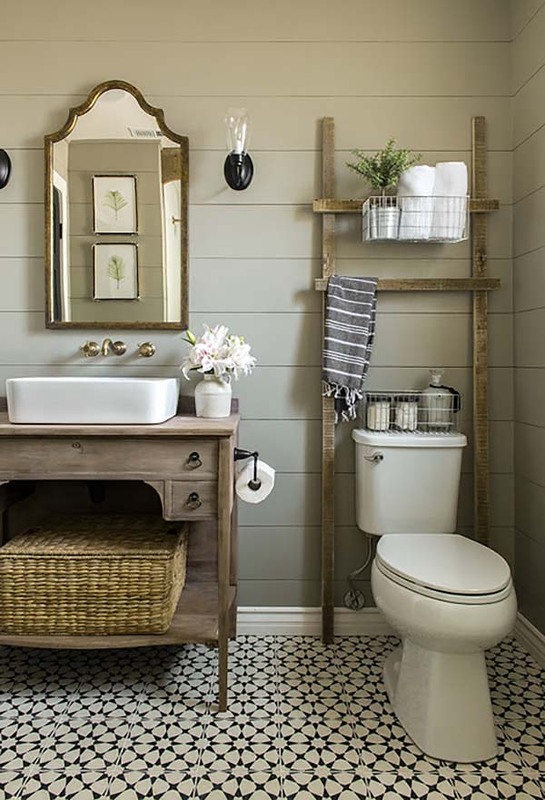 Open farmhouse storage looks great in any bathroom and can open up the space, making it appear visually lighter, but it’s important to avoid all of the clutter, and you can do this with an attractive lidded basket. The right vanity ensures that you have all of the storage space that you need for your bathroom, as well as a functioning sink. Although it can be a little trickier to choose a vanity for a smaller bathroom than one that has plenty of space, with so many great small bathroom vanity ideas there really is something for everybody. Choosing a vanity that will meet your needs is easy when you consider the size of the bathroom, where your vanity will be located, the décor you have used throughout your home, and what kinds of storage you require.